Designed for the needs of the recording professional, the Quantum 4848 is the perfect solution to take your analog gear into the digital domain. 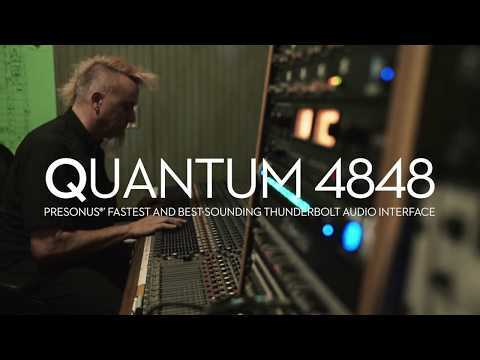 Equipped with 32 inputs and outputs of DB25 line-level connectivity and pristine digital conversion with 120 dB of dynamic range, the Quantum 4848 allows you to bring vintage and boutique analog gear into your DAW at blazingly fast speed thanks to its near-zero-latency Thunderbolt™ interface. 16 additional channels of ADAT Optical I/O let you tie in digital gear, and you can expand your simultaneous I/O to 192 channels. The included Studio One® Professional DAW features Pipeline XT, allowing you to use your analog gear as plug-ins inside your Studio One session. With the Quantum 4848, your audio interface is an integrated extension of your recording environment. Rear panel DB25 line-level I/O makes connecting your Quantum 4848 to your existing analog patchbay a breeze. With 32 channels of inputs and outputs at sample rates up to 192 kHz, you can route audio from your vintage gear and analog recording console to your DAW and back in pristine quality, capturing every nuance of your boutique equipment. Integrating digital gear is facilitated by 16 channels of ADAT I/O. For a full compliment of 48 channels of conversion, you can simply add two DigiMax DP88s via the 16 ADAT channels. A true Thunderbolt device, up to 4 Quantum 4848 interfaces can be stacked to create a 192x192 system—or combine the Quantum 4848 with Quantum and Quantum 2 interfaces to add PreSonus’ recallable XMAX Class A high-headroom preamps. Studio One Professional’s Pipeline XT plug-in lets you insert hardware processors into your Studio One session with automatic latency compensation. Once inserted, Pipeline XT functions just like any other plug-in effect, allowing you to drag and drop it from one channel to the next or change the insert order. Studio One’s latency management allows you to stay in the native processing domain throughout the entire production process, so you can easily mix and match your favorite plug-ins with your favorite boutique hardware processors. Furthermore, Studio One allows the Quantum 4848 to go as fast as you need—flexible dropout protection reduces the risk of audio dropouts in large, CPU-heavy songs, even at very small buffer settings. Every design decision during Quantum’s engineering was made with one goal in mind: speed. Quantum sports high-speed Thunderbolt connectivity and a no-frills, direct-to-DAW architecture that was designed to transport your audio to and from your DAW with an imperceptible amount of latency. Cutting-edge 24-bit, 192 kHz converters with 120 dB of dynamic range ensures the fidelity of your audio as it moves to the digital domain. Some DAWs limit your I/O access when you use third-party audio interfaces. The Quantum 4848 resolves this issue by providing three Channel Profile modes that allow you to adapt the input and output channel configuration when the application you’re using limits you to 32 inputs and outputs or less. Set the Quantum 4848 to use 32 analog inputs with 16 channels of ADAT, 24 analog inputs with 8 channels of ADAT, or 16 analog inputs with 16 channels of ADAT to customize the assortment of analog and digital inputs and better accommodate your needs. And if you get tired of limiting your available inputs, launch Studio One Professional to record up to 192 simultaneous inputs, mix and master your sessions all from the same software. Audiophile-grade digital converters and low-jitter clocking create a superior recording and listening experience. The Quantum audio interface operates at up to 192 kHz for ultra-high-definition mixing and recording. High-quality converters on every input and output provide 120 dB of dynamic range to capture complex musical harmonics smoothly and naturally with no audible distortion. BNC word clock I/O and low-jitter clocking ensure the Quantum 4848 and other digital audio devices operate in tight sync for superior imaging. Designed with the modern analog studio in mind, the Quantum 4848 provides flexible connectivity to easily integrate into analog patchbays, vintage consoles, and more. And with Studio One’s unique Pipeline XT plug-in and performance management tools, bringing your analog studio into the digital domain has never been easier or sounded better. If you’ve read this far, you’re the type of producer or engineer who knows that high-end analog gear is an all-consuming passion. With the Quantum 4848 and Studio One, you can rest assured that you are bridging the analog/digital divide with ease—and with the most transparent signal quality possible. You’ve put a lot of time and money into your studio. Quantum 4848 is here to help you get the best from it. • Dual ADAT inputs and outputs for 16 channels of digital I/O at base sample rates. * Note: there is no stand-alone support for iOS and Android. You can control Quantum-series interfaces from these devices, but the interface must be connected to a computer that is on the same network as the tablet.